Our speaker, Dr Lewis Dartnell from University College London, began his talk called "Astrobiology: the search for alien life" by saying that when he is asked at parties what he does he answers that he studies "Martian death rays". However, he said the official title of his doctorate was the more long-winded: "Computer modelling and experimental work on the astrobiological implications of the Martian subsurface ionising radiation environment". He then went on to say that he started his academic career as a biologist and along the way had to learn astrophysics, geology and planetary science. As he is not able to visit Mars in person he studies rock samples from the McMurdo Dry Valleys in Antarctica where extremely dry desert conditions exist. This high, mountainous region has no snow or ice cover and is swept dry by high-speed katabatic winds. Expanding on the talk's title he explained that, in his opinion, astrobiology was the quest to understand the origin, evolution, distribution and future of life in the Universe. On the difficult question of trying to define what life was, he put forward the idea that life needed three main characteristics. These were, firstly, some way of containing the information that describes an organism's structure somewhat like an instruction manual. Secondly, a metabolism that would take energy in from the environment in order to keep it alive as the natural tendency of the anything in the Universe is to become more disordered. Then, finally, there needs to be a membrane to contain the organism and keep its processes separate from its environment. Dr Dartnell thinks it extremely unlikely that life will be found actually on the surface of Mars. This is because Mars lacks a global magnetic field which would divert incoming cosmic rays and the Martian atmosphere is very thin compared to Earth. 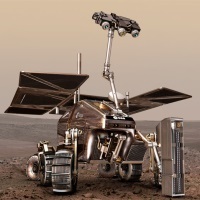 In fact the radiation manages to penetrate the Martian surface and so he eagerly awaits the launch of ESA's ExoMars rover in 2018, which will drill down up to 2 metres to retrieve a sample to be analysed in a small onboard laboratory. Shielded from incoming radiation, there is a chance that the rover will find organisms similar to extremophiles on Earth. These are microbes that can put up with conditions that would kill all other organisms. For example, psychrophiles are found living in brine that is sandwiched between Arctic sea ice where temperatures can go down to -15 °C. At the other end of the temperature scale are thermophiles, which can exist quite happily at temperatures between 45 to122 °C in places such as the hot springs in Yellowstone Park. Dr Dartnell thinks that the most likely place to discover life outside Earth would be within the subsurface oceans of Saturn's moons; especially Enceladus or Europa. It has been proposed that hydrothermal vents, like those at the bottom of Earth's oceans, may be present on these icy moons. Due to the lack of sunlight, the base of the food chain at these vents are bacteria which obtain their energy from the chemicals spewed out from the vents (often called "black smokers").